We are a leading industry dealing in an assorted spectrum of Exide Inverter Plus Battery. Our hold on authentic vendors, helps us in offering our clients the product that are in accordance to set industrial norms. Moreover the entire product-line is checked at various parameters by a team of expert professionals, so that the product can be assured of complete satisfaction. 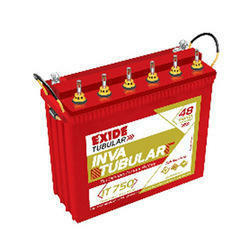 We offer Exide Inva Tubular-it 750 Battery (200 Ah) to our clients. Looking for Exide Inverter Plus Battery ?